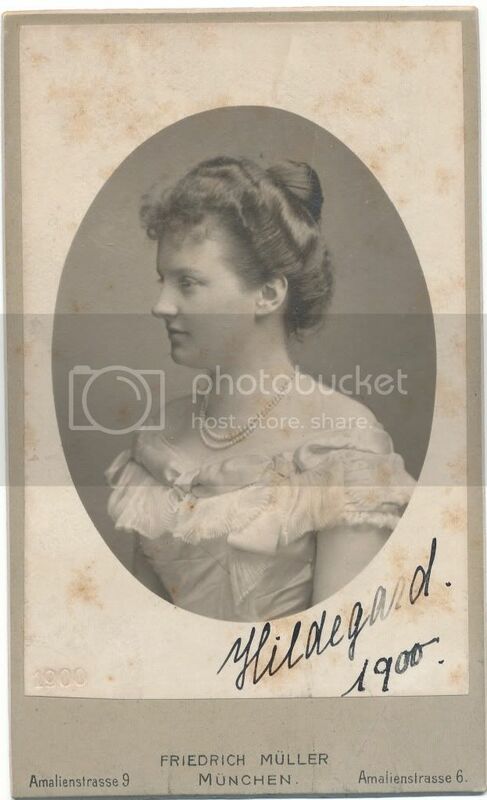 Gundelinde, Wiltrud, Adelgunde, Hildegarde, Helmtrud?? Wiltrud is at right, behind Prince Franz. Sorry, Svetabel ... According to Noël S.Mac Ferran, a specialist (www.jacobite.ca) you can find, from left to right:Gundelinde, Hildegarde, Aldegunde, Karl, Wiltrud, Helmtrud and Franz. I know that site. With the all respect to the specialist I can't agree Helmtrud is behind Franz. I still think that's Wiltrud. Thanks, Svetabel...Helmtrud and Wiltrud are as like as twins indeed. I have just compared the photo of Wiltrud alone to the photo of group. I must say you are certainly right: it is Wiltrud. No doubt. Hildegarde, Wiltrud, their mother, Gundelinde and Helmtrud. Is it right , Svetabel? Do you know why it was Elisabeth Franziska who gave them an allowance instead of Ludwig/Maria Theresia? Was it out of love for her granddaughter of because Ludwig and Maria Theresia could not/would not? I thought Maria Theresia was very wealthy due to her her part of the inheritance of her uncle Francis of Austria-Este, Duke of Modena. I thought even though Franz Ferdinand received a good portion and the title Archduke of Austria-Este that Maria Theresia received a good amount of lands too? hi ! what a gigantic family ! I read that Prince Wolfgang died young (15). Someone knows about this prince ? Why has he died so young? what were his interests? what were his parent's plans his future? Does anyone know how Ruggerio Maria, son of Ferdinand Pius and Maria Ludwiga, died? He was only 13, and his death prompted a family schism.